At Vaughn’s Dojang we are honored and privileged to be one of only 3 martial arts schools in the United States to receive ongoing hapkido training directly from the founder of hapkido, Grandmaster Ji, Han Jae. Hapkido is a Korean martial art that uses holds, joint locks, throws, re-direction, kicks, punches, blocks, pressure points, weapons, and energy flow techniques. 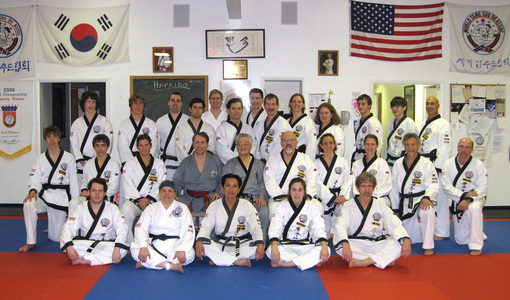 The techniques and philosophies of hapkido training are very complementary to those of Tang Soo Do. See your instructor, Master Lipstein, or Master Vaughn for more information. All Vaughn’s students are strongly encouraged to broaden their martial arts skills by participating in this extremely valuable opportunity! Congratulations to the following students who, in 2009, were the first group at Vaughn's Dojang to receive their Black Belts in Sin Moo Hapkido from Grandmaster Ji, Han Jae and Master Vaughn. All were promoted to Cho Dan, 1st Degree Black Belt with the exception of Mr. Ray Salas who received his E Dan, 2nd Degree Black Belt. 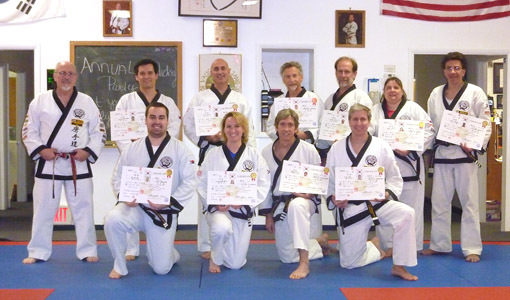 Many of these students have since been promoted to higher rank in hapkido. Master Lipstein now leads the hapkido program at Vaughn's Dojang, under the direction of Master Vaughn.